More than 160 people came to our park on a wonderful fall morning October 28th for our first ever Halloween Scavenger Hunt. 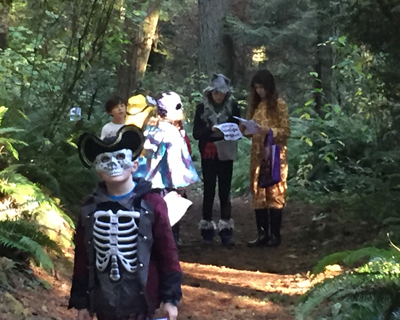 Families hit the Raven Trail to look for 34 Halloween and unique items hidden on the trail, as shown on a handout. They also met a life-size horse skeleton with glowing, red eyes and an eerie voice. Along the trail were photos of some “Bridle Trails Friends” (native animals), accompanied by Halloween jokes. Back in the public area, kids engaged in Pumpkin Bowling, Ring a Witch’s Hat Toss, and Guess How Many (cheese balls) Game (with two $25 Amazon gift cards to winners). Treats provided included Hot Cocoa, Cider, Ghoulish Kettle Corn, and Lots of HALLOWEEN CANDY. Fun for all! And some wonderful costumes!